Yet more classical gothy wonderment - the Gofficeia Insert Skirt! Like the rest of our Gofficeia range, it's as at home in the office as the crypt! Made from soft cotton lycra, with an elasticated waistband. 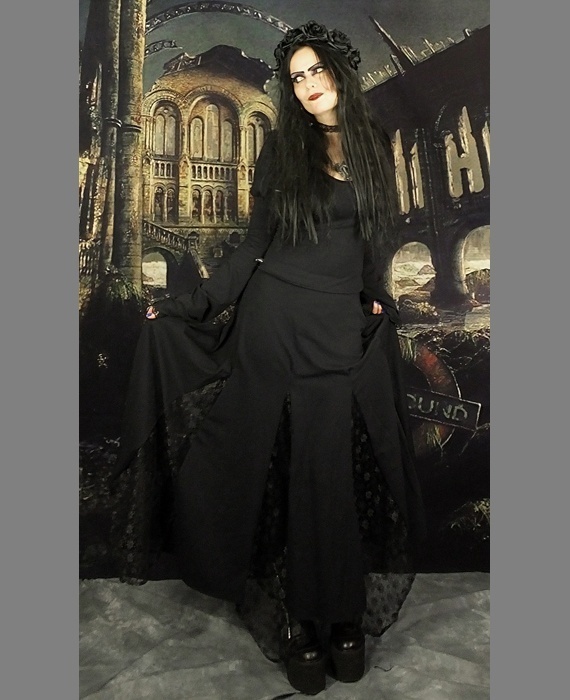 It flares straight out from the waist into an epic A-line hem... with lotsa lace inserts to keep it goth to the max!<br> <br> It can be made in any of our cotton lycra shades; please note that the lace only comes in Black though! :) <br> <br> It's worn here in some pics with our Gofficeia Top... and in others with our Eledhwen Maiden Top! Yet more classical gothy wonderment - the Gofficeia Insert Skirt! Like the rest of our Gofficeia range, it's as at home in the office as the crypt! Made from soft cotton lycra, with an elasticated waistband. It flares straight out from the waist into an epic A-line hem... with lotsa lace inserts to keep it goth to the max! It's worn here in some pics with our Gofficeia Top... and in others with our Eledhwen Maiden Top!